Previously Fusspot. New look, same great recipe. Barking Heads Pooched Salmon Adult Dry Dog Food is a tailored diet for dogs with fussier appetites and sensitive digestions, combining nutritious and delicious salmon and potato. The food contains purely natural and hypoallergenic ingredients to aid in the digestive process and prevent stomach and gut discomfort. Such ingredients are combined in limited amounts and do not include rice, which is known to exacerbate sensitivities. The high salmon content and the specially blended amount of potato will nourish and protect your dog from the inside out, whilst the highly palatable recipe will suit even the fussiest appetites! 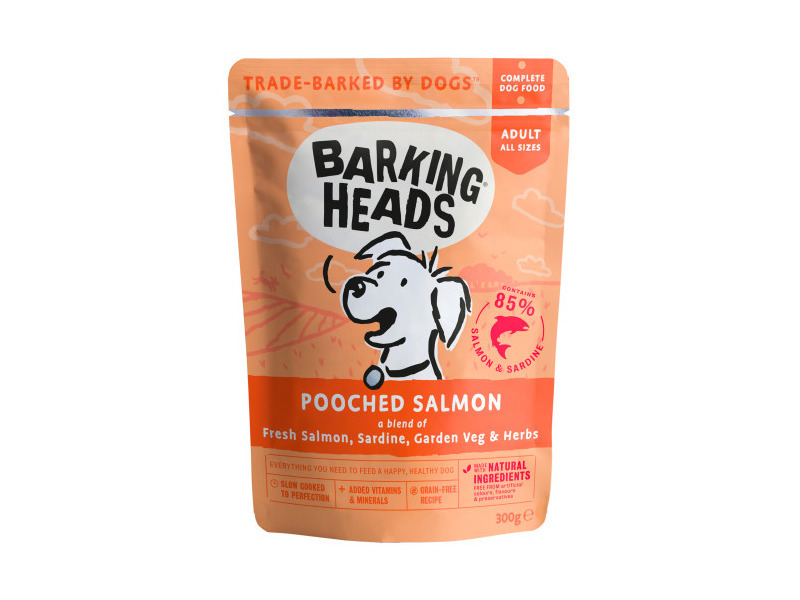 Now available is Barking Heads Pooched Salmon Adult Dry Dog Food wet food which contains fresh Atlantic salmon, vegetables & herbs, gently steamed to capture all the delicious flavours. Also grain free, this complete wet food has Salmon, Potato, Carrots, Peas, Sunflower oil, Salmon oil, Tomato, Seaweed & Basil. There are no artificial colourings, flavourings or preservatives, and no GM ingredients. Barking Heads "Barking Heads Pooched Salmon Adult Dry Dog Food" is a nutritious and delicious diet formulated for dogs with selective appetites. Its carefully chosen ingredients are easy on the stomach and keep discomfort at bay. The food is now available in dry and wet varieties to cater to all preferences. For more information, please get in contact. The following table is a guide to feeding Barking Heads Pooched Salmon Adult Dry Dog Food. All dogs are unique and other factors such as age, activity levels, growth spurts can have an effect on their nutritional needs. Please check with your vet that you dog is at their correct healthy weight. Although your dog may want to devour the whole bag we recommend that your introduce any new food gradually, replacing 25% of their existing food every day until they are eating 100% Barking Heads. There are currently no questions for Barking Heads Pooched Salmon Adult Dry Dog Food - be the first to ask one!